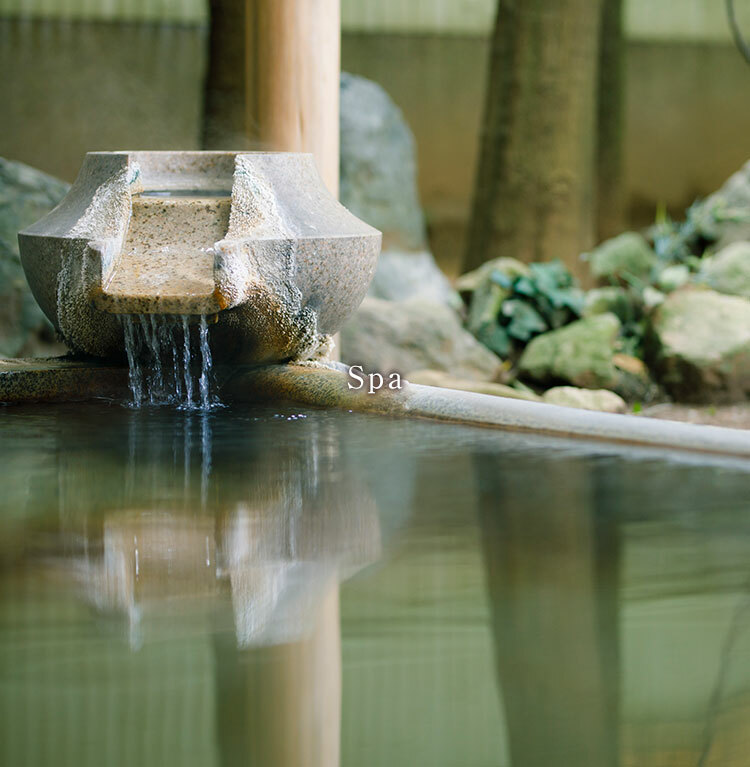 Pure natural hot spring which gushes out without a break. Smell of pure source. 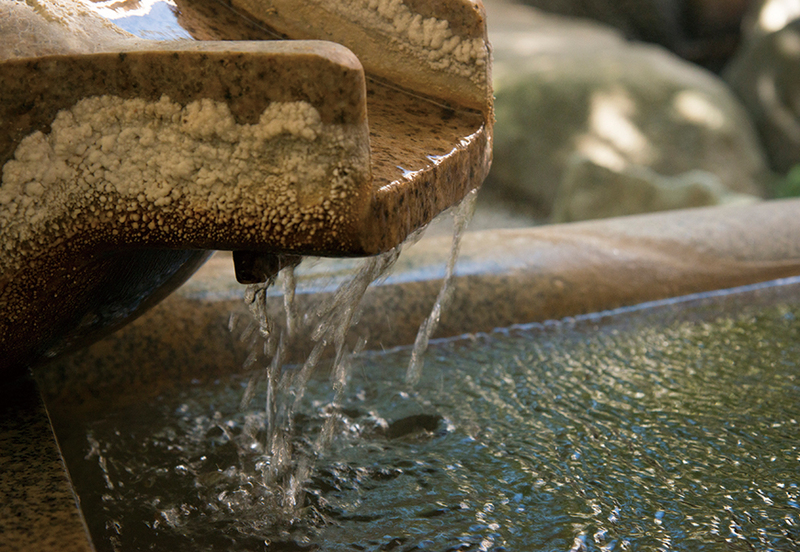 Hot spring which gushes out without a break. 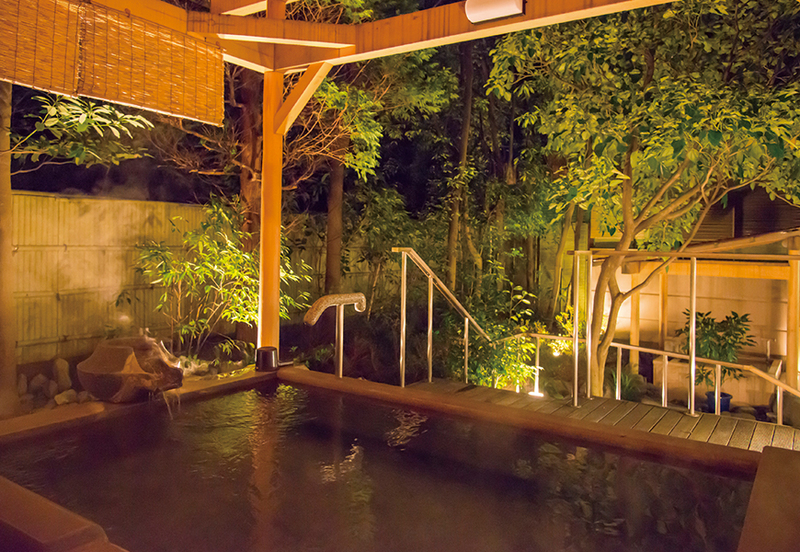 While watching the moon and the stars, please warm up your mind in outdoor open-air bath. 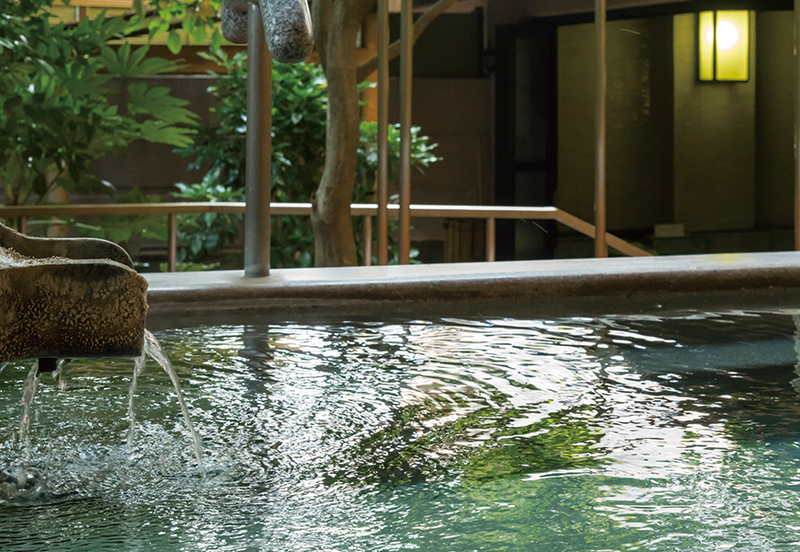 Our natural hot spring uses the source, that is a few case in Yamashiro Hot Spring. 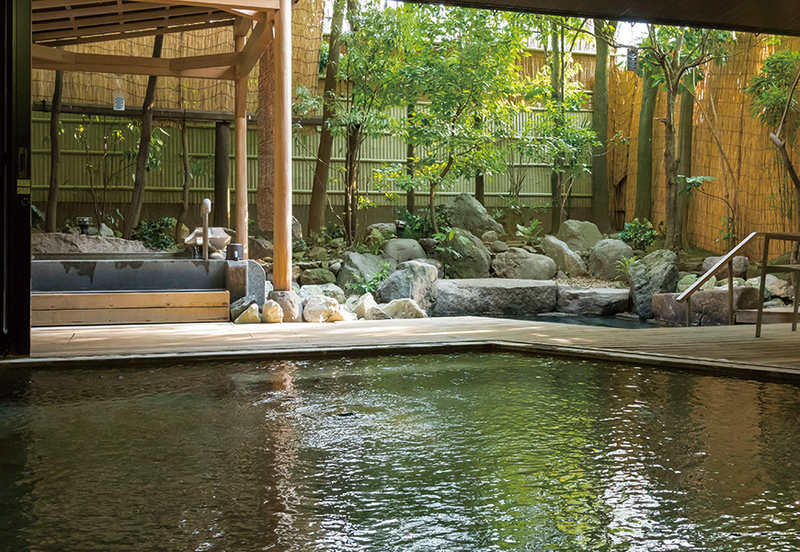 Our boasting hot spring named after historical incident of the priest MYOKAKU who was the chief priest of YAKUOUIN temple, founder of 50 Japanese syllabary call alias “AIUEO no YU”. 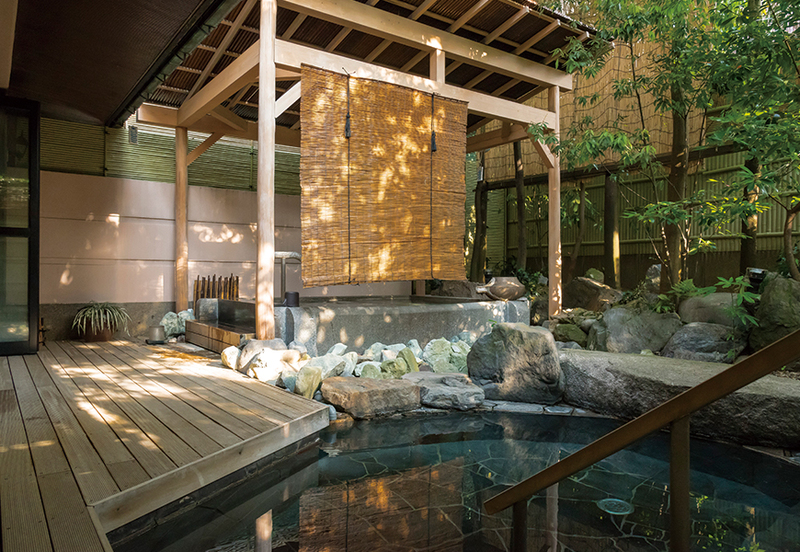 Natural stone outdoor bath continuing from the large public bath where the garden can be seen. 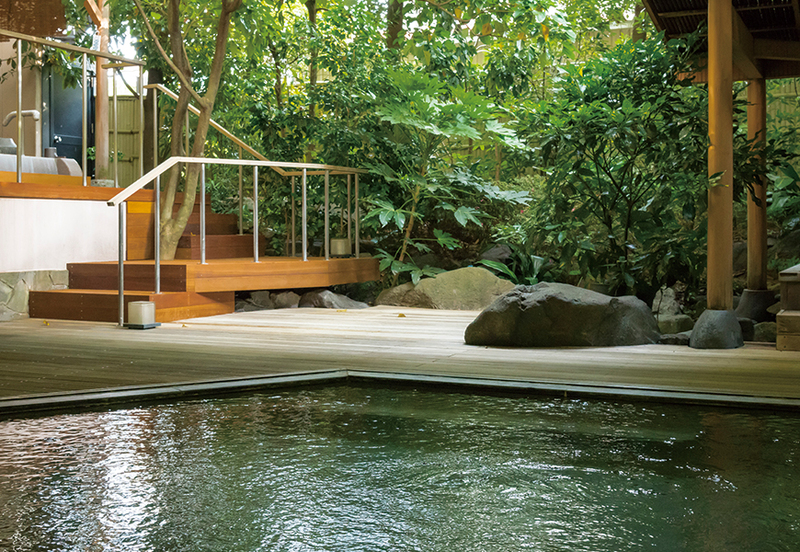 You can relax slowly in the calm atmosphere. Source is poured without a break into the granite bathtub. 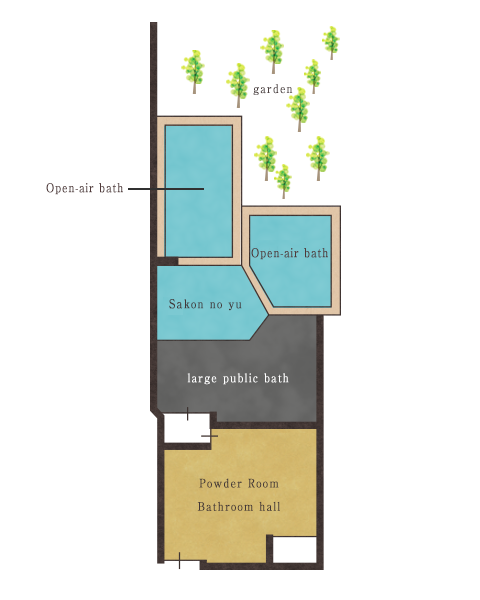 Women will be happy with the partition of washroom and the powder room at changing room. 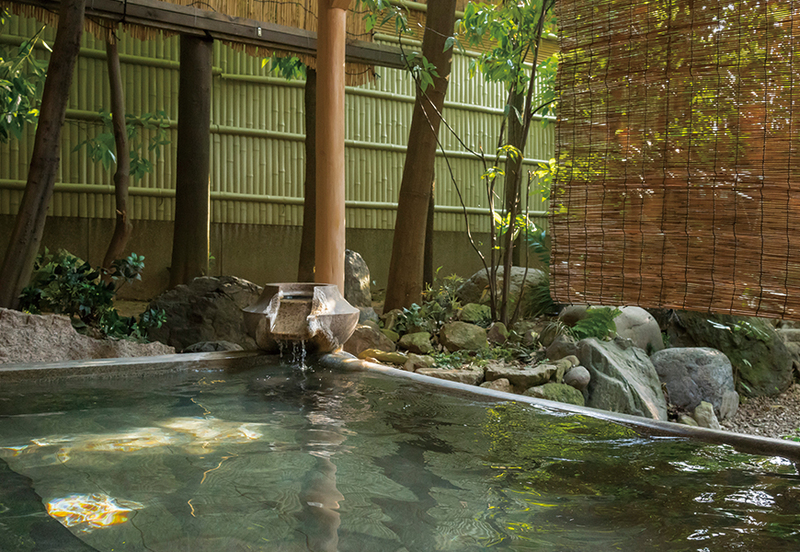 Surrounded by trees, there is a garden open-air bath where you can enjoy a hot tub in the sunlight through the trees. A source that is not mixed is poured from the outlet. In the dressing room for women’s bath, we prepare the separate powder room with separate partitions. 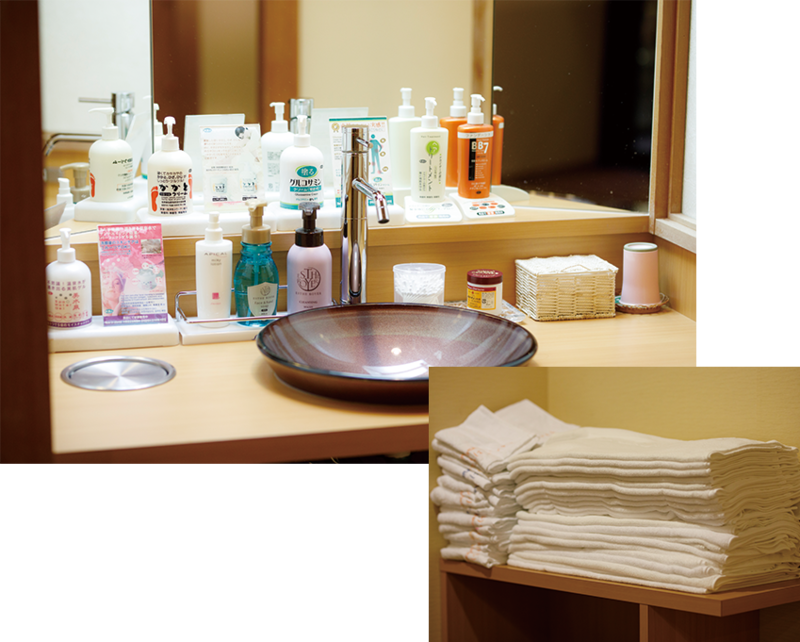 A lot of amenities are available in the powder room for dressing after taking bath. 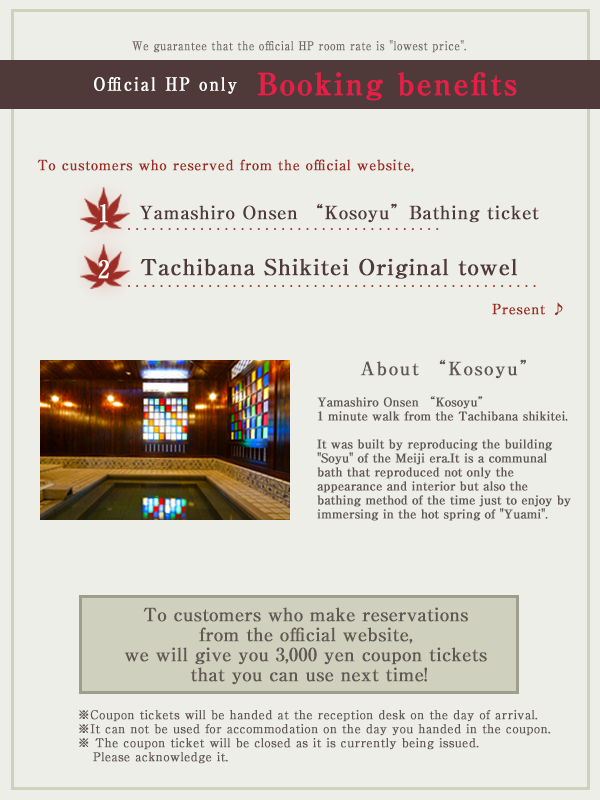 In addition, we are permanently establishing hand towels and bath towels that you can use freely at dressing room so that you can save the trouble of bringing it from your room and feel free to enjoy the hot spring. 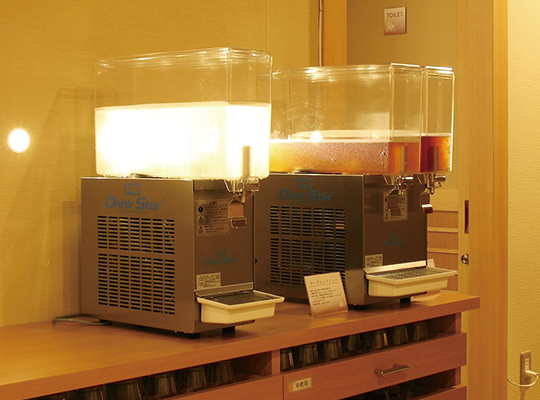 We offer 2 kinds of tea at powder room on a weekly basis, such as Kaga roasted tea, Tochu tea (Chinese tea), black bean tea, rose hip tea, green tea, ginger tea etc. Please enjoy and feel freezing cold tea for a hot body with bath. 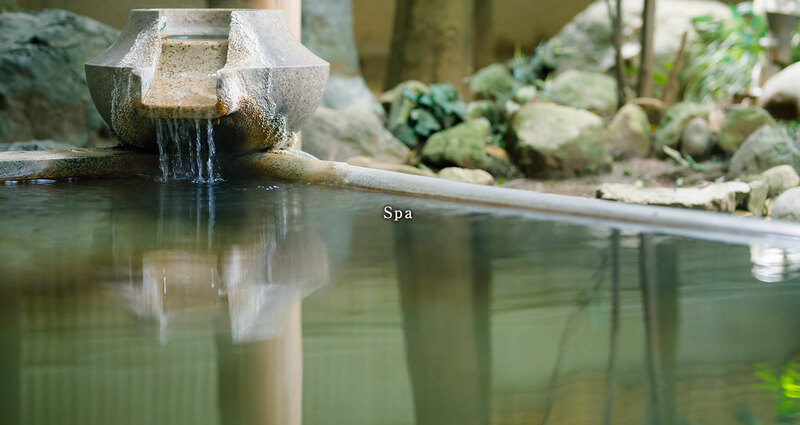 We have the different type of rooms, rooms with inner garden and open-air bath or rooms with open-air bath. 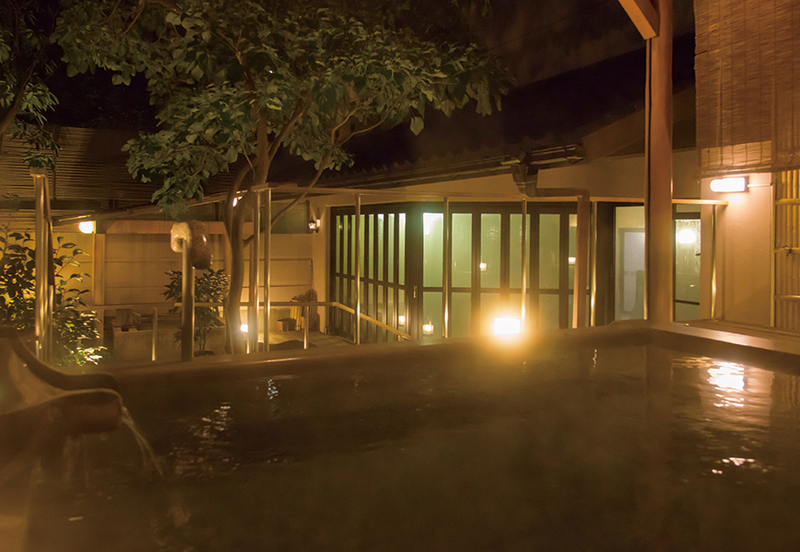 You can enjoy a thoughtful freely during the day and the evening hot water bath in open-air bath where the source is drawn. 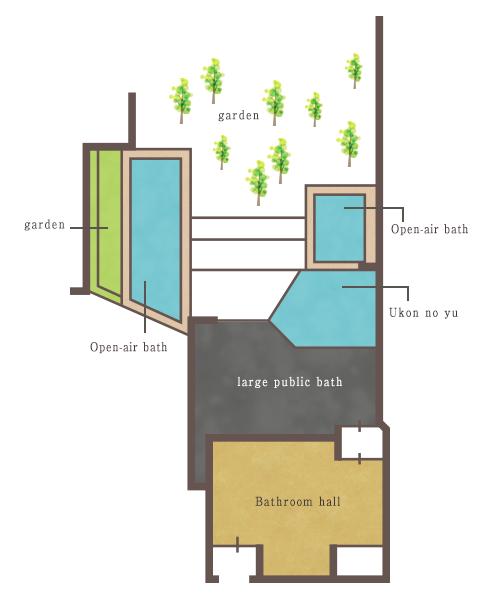 Check rooms with open-air bath in guest room. 1 p.m.　～　11 a.m.
66 degrees　About 45 tons per day.